We are introducing our first Linux VPN command line tool created by ProtonVPN team! 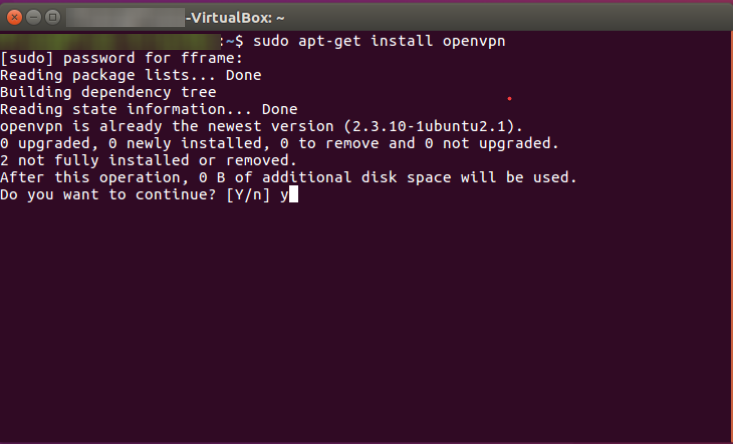 This is a step-by-step guide for installing Linux VPN client tool used on Ubuntu 16.04 LTS. Please open terminal by locating it on your application list or simply pressing CTRL+ALT+T at the same time. Then simply type Y to continue the installation. You will have to do so to install all of the required packages. 2. Proceed installing these packages the same way you installed the first one. Some of these might be already installed so pay attention if it says that it already exists. 7. You will need to enter your OpenVPN username and password which you have to configure on our https://account.protonvpn.com/settings page. 8. After entering the credentials, you will have to select the subscription plan that you have for ProtonVPN. Trial users should select 3) Plus. IMPORTANT: after your trial expires, you need to reconfigure to 1) Free. To set it up, follow instructions starting from step 6. 10. A detailed country list with all of the available ProtonVPN servers for you should appear. Select the server of your preference and click OK.
Once you are connected to the VPN client tool for Linux, you can ensure that there are no IP or DNS leaks here. Closing Terminal window will not disconnect the VPN connection. Use ” sudo protonvpn-cli -disconnect” to close the VPN connection. “pvpn” can be used instead of “protonvpn-cli” command when its installed, so for example, pvpn -c is the same as protonvpn-cli -c.
protonvpn-cli --init Initialize ProtonVPN profile on the machine. protonvpn-cli -c, --connect Select and connect to a ProtonVPN server. protonvpn-cli -c [server-name] [protocol] Connect to a ProtonVPN server by name. protonvpn-cli -r, --random-connect Connect to a random ProtonVPN server. protonvpn-cli -l, --last-connect Connect to the previously used ProtonVPN server. protonvpn-cli -f, --fastest-connect Connect to the fastest available ProtonVPN server. protonvpn-cli -p2p, --p2p-connect Connect to the fastest available P2P ProtonVPN server. protonvpn-cli -cc, --country-connect Select and connect to a ProtonVPN server by country. protonvpn-cli -cc [country-name] [protocol] Connect to the fastest available server in a specific country. protonvpn-cli -d, --disconnect Disconnect the current session. protonvpn-cli --reconnect Reconnect to the current server. protonvpn-cli --ip Print the current public IP address. protonvpn-cli --status Print connection status. Would it be possible to get some sort of visual cue in gnome to know that the connection is established? When using the (inferior) GUI, there is a lock symbol on the wifi icon. Would something like this be possible when using the CMD line? Hello Mike, currently there is no way of doing so but we had familiar requests before so its on our to-do list to see what we can do . i have a routeur Asus rt-ac68u and i want to know if it compatible with your server??? [!] Error: dialog is not installed. Install `dialog` package to continue. Hello Owen, it says that you did not install the “Dialog” package as per instructions. Please re-fallow them and install everything that is require in the article. Everything before this seemed to install and function as expected. I am on Fedora 28 and the potonvpn-cli.sh installed requires, but offers to install update-resolv-conf (if using this method) since Fedora doesn’t have this which I did… Unfortunately, that script intern failed because Fedora doesn’t have resolvconf. This worked for me on Fedora as well. Thanks for taking the time to post it! I have already tried sudo apt-get install openresolv, and it doesn’t work. Hello Chicken. Please use pvpn -update and then use pvpn -init to re-enter your OpenVPn credentials. This is my error code. I can not connect. Any ideas? Ubuntu 16.04. Checked the credentials 3 times. Restarted the process and re installed twice. Tried with GNOME GUI. Now I ran out of ideas. Any suggestions? Hello Blaz, are you sure you are connecting to the server that is appropriate to your current subscription plan ? I had to init several times as I didn’t notice the password field does not allow pasting from clipboard, at least not with Konsole on KDE. I had to type it. Maybe you could make it clear in step 8 or check the credentials against a test connection while init? But other than that, it’s great, protonvpn-cli is in AUR and with the init done correctly it just worked without issues on my manjaro system. Thank you very much, because until now I had several VPN profiles in my NetworkManager and was never sure about the current load on the servers before connecting, this ncurses based tool solves exactly my problem. Sometimes I get the IPV6 message. The openresolv package is installed. This client used to work reliably but now it very rarely works. Hello. Please try updating the client using pvpn -update and then re-initiate it using pvpn -init. Sometime this works. Sometime it does not. It always fails again after a while. Hello. Sorry, but we did not catch if you do have a ProtonVPN subscription already? It’s great to see Proton put out a CLI tool, but this looks like a lot of extra steps than clicking the standard Network-Manager app and selecting from the list of connections. It took me 5 minutes to input all the IP and VPN settings for all of the potential connections and it only takes me 10 seconds to switch from one to another using the NM. I realise many Linux users only use the command line and this solution fits well with that environment, but for the many users who are not comfortable with the CLI and wish to have a simple solution, the NM setup is a little more user-friendly. I think there’s an opportunity for a simple graphical interface to handle the heavy lifting in the background yet provide a less-complex interface for less-savvy users. I still applaud the CLI tool; it’s a good step. Please explain me why i cannot connect ? any ideas to help progress the install. Hello Mike, if you are under restricted network, it could be that you cannot reach the github. Can you open that link on the browser? If so, it has to work. You can try running a few of these to see if you can reach the website with these commands. I am at the part where it list the servers to choose from in the terminal. I am wondering how to tell which are secure core servers. I see labels like none, free, plus, and plus-tor, but how do I actually tell which ones are secure core servers? Are all the ones labeled plus secure core servers? Hello Bruce, step 10 in this guide, you can see the most right side column and it has none most of the times in it, search secure core in that column and you will find the appropriate servers. Thanks for the easy guide, please add a gui client like windows! Hello Sam, Currently we do not have plans for that, but we do know that our customers seek for an easier way of connecting on Linux and we will be working towards that in the future! Wow! I just saw you guys implemented a P2P flag! Did my comment on 4 July play an role? I might be kidding myself but I hope it did. And only two months later. Wow. You guys really do listen! I assume most companies don’t listen to anything users say. This made my day! THANK YOU PROTON! Is there a way to automate the connection at startup on a linux workstation? Hello Monrus, there are many ways to initiate the script upon machine start on linux, but we do not have an official way that would work for all of the customers, so we advise to check accordingly to your distribution. I am very happy with the PVPN interface for use with Windows. But I’m a complete noobie on Linux and the whole set-up is very disappointing to me as: a. I’ve got no idea how to set it up and b. there doesn’t appear to be an interface? If there were some videos to assist it would be a help to me. I have signed up for the PLUS contract after watching good reviews on YouTube but if I can’t get it to work is there any chance I can get my money back? Ive tried reinstalling it multiple times and made sure I initialized it without any typos. I also tried multiple servers and both protocols available. I currently run Void Linux with NetworkManager and all required packages installed. I have no problems when connecting with OpenVPN, but the CLI seems like a better option to me. Do you have any ideas on what I could do to make it work? on the latest version on cli tool for Linux there is an error on disconnection command: after disconnection from ProtonVPN I get an error getting my original IP (not shown) and after entire connection ADSL go down. I can only reboot my PC. Killswitch is not enabled. I have got my ProtonVPN connect after I have followed your instructions. [#] protonvpn-cli has been updated successfully. But the “protonvpn-cli.sh” file (owner root) isn’t updated: the github version is very different. 1) What do update the “protonvpn-cli –update” command? 2) Do the “protonvpn-cli.sh” must be overwritten manually every time? Will this linux client tool installation work for Ubuntu 18.04 as well? If not, can you lead us through the installation under Ubuntu 18.04? Hello Franke, this linux client tool works just fine on Ubuntu 18.04. Well done on providing this excellent tool. Been using it for a couple of months now on my Ubuntu 18.04 release. Just a question in regards to the commands: pvpn -cc [country-name] [protocol] AND pvpn -cc [server-name] [protocol]. Please can you give an example for the country name and server names as when I try pvpn -cc [uk] [tcp] it returns with Invalid country name. I use the CLI tool to connect to VPN servers in my Kubuntu installation. How would the users be informed of any disconnections from VPN server? Hello. Have you tried continuing to install it without sysctl? if I want to switch from a ProtonVPN user to another (both free and on same PC) do I have to run “sudo protonvpn-cli -init” everytime and to type the new username/password, right? Hello Dezel, yes, you have to re-initiate the client to tell him that this is the user credentials that you want to use. Does anyone know how to create a desktop launcher for the client on Elementary OS? It’s so easy on Mint. B-click and create. Boom. I have searched a myriad of sites and I guess there is something technical I’m just not getting. Thanks to anyone with any help. I am having some trouble following the instructions in this script, I have been using your protonvpn product on windows 10 for some time now, with no issues, but now i am going back to linux, and I am using slackware 14.2, also i’m not what you’d call the most experienced linux user, anyhow, I have been going over this setup with a more experienced user at LinuxQuestions and I managed to get this installed, but it would only work as root, which i believe to be insecure, and not at all what people would be after especially in terms of security, upon more digging, iwe have discovered that this is limitation of openVPN, is this correct, ? Is there some way you guys can re-write this script or something, so it it not locked to the root account. ? Hello Nathan. For now, we cannot change anything how the script works, as root is required, but we will surely try to figure something out if its possible to rewrite it and use it without it. Hello, please try installing this: sudo apt-get install openresolv , and then connecting again. Hello. After step 8 the terminal asks me “Would you like to use a custom DNS server? (Warning: This would make your VPN connection vulnerable to DNS leaks. Only use it when you know what you’re doing) [Y/N] (Default: N):”. In either case (Y or N), the terminal asks me after steps 9 : “[!] Error: OpenVPN is already running on this machine.” and I am unable to reach step 10. Please can you provide some help? Hello Nico, that means somewhere there is a VPN client running on your machine already, that is why it cannot create a new connection on top of that. You will have to find that connection and terminate in order to launch our VPN. If you do not know of any connection that is active, please restart the machine and try again, it could be that its cached somewhere. I have Linux mint OS (presumably the same as ubuntu for this purpose). I have downloaded protonvpn-cli tool and associated programs but when I tried to connect to raw.githubuserconnect… I got an error 404 Not Found. Hello Jucu, so when you are trying to download the script it seems, please make sure that the link entered is correct, or copy paste it from our guide , otherwise you will get 404. Hello there, do you have in plans a linux client like in Windows? Hello. For now, no, we do not have any plans to release the UI as in windows. Hello. Please make sure you use the OpenVPN/IKEv2 manual connection credentials which you can find under your profile account. I don’t understand… Why not just give us the OpenVPN config file(s) and let us manage the connection. Why must I run a shell script? Has anyone audited the shell script? What is the shell script installing beyond the OpenVPN config files? I have tried turning off my IPv6 and even resetting it, however, I have had no success. Works perfectly under Linux Mint 19, thanks! [!] Reason: Authentication Failed. Please check you ProtonVPN OpenVPN credentials. Is there a way to specify to connect just to the fastest P2P-friendly server? Or even simply connect to any P2P server at random? If I use protonvpn-cli -f, I may be connected to one that doesn’t allow P2P traffic and then torrent files will fail, correct? Hello. Sadly for now we do not have an option like that in our client tool for Linux. Nonetheless, we will mark this as a suggestion for our developers to consider. Thank you kindly! Also, I appreciate you adding the -l flag to get right back to the last server chosen. I believe that’s a recent addition, and it’s pretty useful! Good people, is there a way to automate it so this starts up right away on bootup and won’t get any IP address except the one from ProtonVPN? Using this on a Raspberry Pi. There are many different ways to automate it, but currently we do not have an official one. You should lookup on how to start a script on boot with Raspberry, since our cli tool is only a python script. Also, how can I ensure there’s no leaks with the Pi? Hello. Disconnecting from the SSH session should not disconnect the VPN itself on the device. Also, for no leakage, you can use command “curl https://ipleak.net/json/” to see what IP ipleak website sees. I don’t like the name very much. Does it really need to be that long and include the ‘-‘ sign? Hello. Please provide more constructive feedback as we dont quite understand to what name you are referring to. 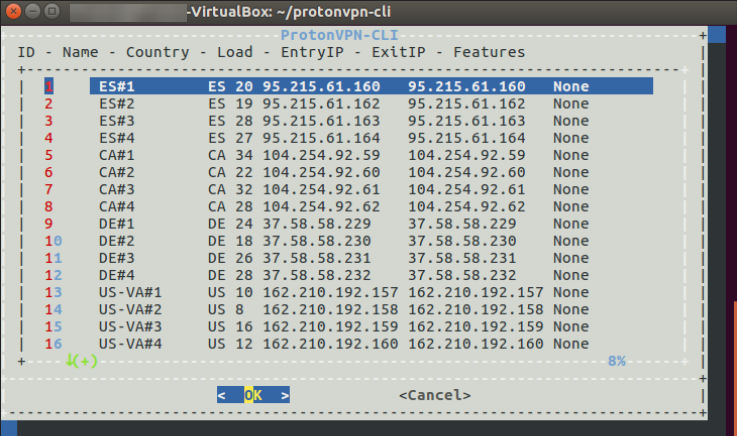 All of the protonvpn-cli commands can be used with “pvpn” , for example, “pvpn -c” will do the same as Protonvpn-cli –connect. 1. How can I autostart the VPN connection in Linux? I have Linux Mint (but am no Linux expert) and each time I reboot I have to open a Terminal, enter sudo protonvpn-cli -connect, choose my server, choose UDP, then it connects. Is it possible to automate this? 2. I chanced upon an in-depth IP disclosure page http://ipleak.com/full-report/ and noticed that websites can tell that I am using a VPN because my system time was different to the IP timezone. That explained why Google search would not work (I use duckduckgo but sometimes have to resort to Big Brother). I synchronized my system time with the VPN server time and now Google search works, and other websites will have to dig a bit deeper to see that I am using a VPN. Maybe you could mention this in your setup instructions. Thanks for the VPN and encrypted email services. Hello! Currently we do not have a specific method that we would recommend using to start the linux client on boot, but there are many different ways for different distributions that you can look up, just search “starting a script on …” . As per second observation, we appreciate giving us a heads up, this might become useful information for some of our customers, bet to be honest, we have not heard almost any reports of machine time sync issues with VPN server. They can detect that its a VPN, since the IP itself, since its shared IP, does bring more traffic than a single user would and its ISP is a server host, so its not that hard to identify VPN or proxy servers in general. Okay, I found a way for the connection error to go away. On https://protonvpn.com/support/linux-vpn-setup/ it talks about resolvconf (I imagine as opposed to openresolv) so I just had to “sudo apt-get update && sudo apt-get install resolvconf” and now it connects. If this is not a security impairment, maybe it should be mentioned above. the last step off installation,after connecting , it gives error . what can y do? thank you. Try using OpenVPN/IKEv2 Username and Password that are given in your account page. Just copy and past. Fellas I was having the same problem with the resolv.conf fileand internet connection failure. I tried reinstalling resolvconf but it gave me an error at the end saying it was immutable it then advised me to run 2 commands one starting with chattr and the other dpkg –connect resolvconf (unfortunately after the terminal gave the list of vpns it no longer shows me the previous command history) . After running those commands I tried reinstalling resolvconf “apt-get install resolvconf” and the errors where gone. I then went on to reconnect to my wifi “service network-manager restart” and immediately after ran the command “protonvpn-cli -connect” and now everything works and I no longer have dns leaks! I hope this helps fellas! [!] Error: OpenVPN is already running on this machine. I am using the correct openvpn user name and password. I have also reinstalled and re initialized pvpn. Any guidance in correcting this issue would be appreciated. Hello Sam, the error is what it states, it sees that there is some other VPN software or service running at the same time and running two of them, using the cli, is impossible right now. Did you try restarting the pc? Maybe something is cached by your system. Hi – I have an error when connecting. initialized correctly with “sudo protonvpn-cli -init. Then I disabled ipV6 with the additions to sysctl as given above. But when I try to connect to VPN, it complains that I don’t have ipv6 enabled! Is it necessary to re-enable ipv6 to get a successful login? Is it necessary to re-enable ipv6 to get a successful login? followup: I installed openresolv per your advice to another poster. Now able to connect the VPN. what are the (in)security risks in using openresolv? Thanks! Hello Steve, openresolv has no security risks and is required to install whenever installing the pvpn tool. You’ve must have pressed no where it was required. It manages the DNS addresses, when you connect to the VPN server and disconnect. Checked, double checked, changed password, same thing. Hello. I had this error when I make ctrl-p (copy then paste) my credentials from my protonvpn account. Then I typed directly my credentials in the terminal and now all is ok.
Is there a way to directly change the vpn server without disconnecting/reconnecting with ‘ sudo protonvpn-cli -disconnect’ / ‘sudo protonvpn-cli -connect’ ? Hello John, you can try using pvpn -f to reconnect to the fastest. If it says that the openvpn client is already running, then you will have to disconnect manually and reconnect to the vpn server. I did get protonvpn working using the NetworkManager-openvpn-gnome method. I thought I once saw a guide describing the naming conventions for the configuration file names. Can you post it again? Hello David, its pretty simple. The first to letters stand for the Country, if it has more letters going afterwards, then its a state in that country, for example, lets say us-il-01.protonvpn.com , that would be that the server is in the united states and in Illinois and its the 1st server in that state. if there are more servers in the same location, they will go after that one numerically, 2,3,4 and so on. Hi, does the Linux client already implement the failsafe mechanism? So that, if for some reason the connection to VPN drops, the Linux client stops being connected to the internet. Hello, Sadly, but no. As the killswitch is hard to implement to be working on all of the linux distributions, but we are surely looking for a way to do that! Hello Marcus, please contact our customer support team and we will let you know about it. Hi! I tested Kubuntu 18.04 LTS (clean install) and this Linux client tool is the ONLY WAY for me to have no DNS leaks. If i connect with standard OpenVPN client or KDE NetworkManager – I have stable DNS leaks. Hello Ali, are you sure you have entered the correct credentials of your OpenVPN username and password in to the tool when using pvpn -init? I think it’s related to the VPN bans here in Turkey (Ali is a Turkish name soo I assumed he was from Turkey), I’m getting the same error under Ubuntu 18.04 with this client. And yes, I have a PiVPN Server running. But why is your client doing this? I want my own OpenVPN server running for my clients to be able to connect and at the same time this machine should have the possibility to make a client VPN connection to your servers…why shouldn’t this be possible and how can we fix that? Hello. Could you please make sure that you are using your OpenVPN credentials within the client-tool. You can find them on our website, when you log in with your account. They are called OpenVPN/IKEv2 credentials. Yes , I used the correct credentials. This is what I get. Hello. Sysctl package is embedded in almost all of the linux platforms so this what you get while trying to install is totally normal. Are you sure that you are using the OpenVPN credentials required to make a connection to the VPN server? You can find them when you log in to your account on our page. I don’t understand. (1) Since the Sysctl package is embedded in almost all of the linux platforms, why did K get that error and why would it be normal? (2) In a situation where sysctl is not installed, how and from where do we download it? Hello. Please try proceeding without Sysctl installment. It should be as good to go too. I am having problems connecting to the VPN using Linux Mint and the Terminal command line. The problem appears after I enter “sudo protonvpn-cli -connect” I get the list of Proton VPN servers to choose, I choose one. Next screen is a choice of UDP or TCP, then I choose one. Next, a message comes up saying connecting. I get a reply message saying Error Connecting to the VPN. Ive tried connecting to a number of the VPN servers, choosing either UDP and TCP without luck. What am I doing wrong? I used to be able to connect to ProtonVPN on openSUSE Tumbleweed but for some reason, the VPN has stopped working. It will still connect and I get confirmation of a new IP address. But when I issue the command “sudo pvpn –status” the last line always shows me as disconnected. I can’t browse or connect to mail and it appears DNS isn’t working, even though /etc/resolv.conf gets updated. Hey, so everything worked great until I got an error about the program not being able to manage IPv6 connections, can you help me figure out the issue? Hello there. If the connection was fine before and started not working right now, we would suggest to re-initiate it and type in “pvpn -init” , then enter the correct openvpn credentials and try connecting again! User of Linux Mint 17.3. I have subscribed the Free plan. I connect to the net over a UMTS dongle. After several attempts to connect to VP server I get the message (!) Error connecting to VPN. Have initialized the plan but the issue persists. Thank you. I’d tried in the past to get my Linux VM connected but it always had a leak, now that’s gone. Do you have plans for a GUI for this in the future? Hello Will, we do not currently have any plans for the GUI as there are other priorities right now in our services. But we wont forget our dearest linux users for sure! For no apparent reason. I am using the correct username/password from the account page. Nothing else was giving me an error message. After playing around further with this issue, I noticed that I cannot connect to any of the available servers by using UDP protocol. I used to be able to connect by typing “sudo protonvpn-cli -f” and it would auto-connect me. However, now I have to do “sudo protonvpn-cli -c”, select a server and connect to it using TCP. The connection will then be successful. However, if I do try to connect to the servers using UDP the connection will fail, and it will provide the same error message. Oh it looks like I replied to the wrong comment, my apologies! Hello Anna, no worries about the comment. It might be that the network that you are currently in is not accepting the UDP protocol for one simple reason, the 1194 port could be blocked (which UDP uses to connect you) and TCP (443 port) connects because on most networks, its open and functional. when i use the login on my account after I login at the protonvpn.com home page, it gives me the aformentioned error message. When using the login I used to get into that account it says to enable ipv6 manually, although it already is enabled. Hello Jack, this means that our client cannot manage your IVP6 settings automatically, IPV6 should be enabled at all times since the client during the connection will disable it and when disconnecting will change back to default and yes you have to use the openvpn credentials, not the ones you use to log in to our website. My IPv6 is automatically enabled though through my vpn and router settings. How would I get the tool to recognized the settings? Last time it worked with no issues, however after re-installing my system, I was never able to connect again. I had a randomly generated password with non-alphanumeric characters. Something was getting lost when pasting the password. Logs showed openvpn authentication failure. Changing the password to all alphanumeric characters resolved the issue. ProtonVPN team, would be great if authentication failures would be reported as such instead of a generic message. Hello Nazar, Thank you for the feedback and we are happy to hear that it is fixed for now. The logging is done by OpenVPN and you can change the verbose level in the configuration file (server file) that you are connecting to. Some OpenVPN clients have settings where you can change the verbose in the UI. Hello, I keep getting a, “[!] Error: python is not installed. Install `python` package to continue.” after I “sudo ./protonvpn-cli.sh –install”. I try “sudo apt-get install python3” but I still get the same error message after re-entering “sudo ./protonvpn-cli.sh –install” again afterwards. What am I missing? Thanks. Hello Arthur. We already communicated via the emails, could you please try this? If there is an error, then there will be an error. Then search for the python executable path, and symlink it to /usr/bin/python. Does this connect on boot, or do I have to manually start it? Hello Marc, you have to start the client manually as for now there is no option to connect on boot. Works perfectly on Debian 9. Is there a way to make it connect on boot? Hello Mark, currently we do not have a way for that, sorry . My fresh Lubuntu 18.04 LTS often ends up with new IP that doesn’t match the Exit IP listed next to any of the free NL and US servers I’d choose from the fetched server list, after connecting successfully. Note that everything worked flawlessly in Ubuntu 16.04 LTS on the same machine for a couple of weeks – no matter what server did I choose to connect, new IP did match the listed Exit IP every time. Just letting you know, and thank you for this handy way to strenghten my online privacy, dear PVPN team! Do you have Ubuntu 18.04 specific instructions? Hello Keith, Ubuntu 18.04 should work the same way as for ubuntu 16.04 LTS. Because there is no explanation why it can’t connect, I’m a bit stuck. Credentials are correct and no FW rules that block. NVM……figured it out…..connection is set. Hello Alexander, glad to hear that it is set right now, so what was the issue in the first place? How do I enable the connection manually, using Linux Mint 18.3? Not able to manage ipv6 by protonvpn-cli might cause issues in leaking the system’s ipv6 address. You MUST USE the OPENVPN username and password ! (Log in to the ProtonVPN dashboard and click on Account tab to find it). NOT NOT NOT your protonVPN login and password !! I already disabled/enabled wifi but it didn’t helped. ps: I am currently using Linux Mint 18.3 on a Lenovo Thinkpad T430. Hello Toni, may we ask, do you have Firejail installed or any other sort of firewall or security package? This could cause the issue of not being able to allow our client to fetch for the servers for you to connect to. Just got it running on Mint 18.3 Thinkpad T410 (not that I think the hardware’s got much to do with it). I’d originally changed the password to a preset algo in KeePass that contains special chars. When running protonvpn-cli -init it appears that it’s escaped a character. Because there was a discrepancy when I checked what I’d entered against what was in the file. It was only after I changed the password (on protonmail.com) to something simple (10 char alphanumeric), that it started working. I’ve since changed it a 30+ Alphanumeric and it’s still working. Like I say, I’m not sure *which* of these steps got it working, (if any – maybe you guys did something in the background while I was doing this) but it’s now working for me. *Sorry, posted reply to wrong comment. It did have an update ready. It shows error in connecting to VPN. How I connect it. I followed the instructions and I got the following error code. I’m using Linux Mint 18.3 with Cinnamon on a Lenovo Yoga 2 Pro. Is there some sort of debug mode that I can get more information on this error?? I would like to confirm that this current LInux Client Tool will still be compatible with the upcoming release of Ubuntu 18.04? Hello Mike, as we tested it on our VM machine, it is functioning as it normally would. 🙂 If it will get not supported after some updates, we will adjust the cli tool accordingly to support it. On Fedora 27, I got a couple of errors relating to ipv6, and then it took to failing with the unhelpful [!] Error connecting to VPN. I have got it to run on a Fedora vm in Qubes OS. Tried it again tonight, now it works and was verified by checking the ipleak link. I’m running Arch and didn’t have to make any ipv6 or any other extra configuration changes. Looking forward to more testing, so far so good! Hello, thank you for letting us know about the issue, we will do our best to look in to it and reproducing it. I’m currrently on the latest version of ParrotSec OS (with working internet), yet I still get this error. What can I do? [!] Error: There is an internet connection issue. Hello Anton, we are currently investigating the situation with ParrotSec, since we can reproduce it. Hello Proph, we are currently investigating the parrotSec issue with our linux tool client. I did the second options because i have others app which bug with firejail. After i remove it, thats work perfectly. do you have python3 installed? You have made a typo in the solus package management command. It’s “eopkg” not “eopgk” as written above. Hello Pavan, good spotting! We fixed it, thank you. Hi! There is NO “sysctl” package in Ubuntu 18.04 (beta2). It’s important to install this package? Hello, Yes, its required to have that package installed for the client to run and connect successfully. procps instead of sysctl package on Debian 9 as well. Ok thanks, will do that. Also I was wondering if you have any plans to release a GUI version for Linux just like you have for Windows and Android? Hello Rob, it is in our plans, but not as a main priority right now, so we cannot estimate any time frame for that to be released. For now, we are polishing the Cli-tool. Please add support for upcoming Ubuntu(Kubuntu) 18.04 LTS release. Please add auto-connect on startup option – this would be awesome! I agree wholeheartedly! This is a great idea. linux beginner here. I’ve followed the tutorial and everything is working fine so far. Now I want the client to auto-connect on startup. How can I achieve this? I already tried with setting up a crontab, but this doesn’t seem to work. Hello, as we tested with crontab, the script starts before the network does so it would be better to try doing so via systemd init.d file. We don’t actually have an official guide yet, but will make sure to do one soon. hi, i would also love to see a guide to make it work from startup on ubuntu/debian. also, on android there is this nice feature showing a key icon in the top bar when we are logged into a VPN, do you know how to achieve that too in gnome ? Hello. We will try to find a working way for most of the platforms and when we do we will update the article. For the key, you are talking about two different operating systems thus it does not work that way 🙂 There is no way to do so on Gnome sadly. However I enable IPv6, it also didn’t work, and got the same error info, so what could I do? Thanks for contacting protonvpn support. We have reviewed the report, may you please report it to github (https://github.com/ProtonVPN/protonvpn-cli), so our developers can review and fix your reported issue. I get this message when I try to connect: “There are issues in managing IPv6 in the system. Please test the system for the root cause.” Do you have any suggestions for how to debug or fix this issue? I’m on Ubuntu 16.04. Thank you! Getting this error when trying to start the VPN. Running on Debian 8.x. Tried as root or normal user using sudo. Same error. IPv6 is disabled. Our client tool will see an update with possilbe iptables killswitch, as one user created it but we have yet to test it our and debug it if we find anything, so stay tooned! GOD BLESS YOU GUYS!!! Build-in killswitch is a VERY IMPORTANT THING! A lot of us don’t know how setup a killswitch in Linux/Ubuntu. Build-in solution would be nice. Please do it. Please test it on Ubuntu(Kubuntu) 16.04/18.04 LTS releases. I have used this OpenVPN iptables kill-switch script for awhile now, so anyone looking to really lock up any possible DNS leaks your gonna want to go with something like this, basically iptables will only allow traffic to flow through the tunnel, if the tunnel or connection goes down it will kill all traffic. No leaks, just like huggies. Works perfectly with Debian stable, using basic instructions above. Many Thanks to the Proton Team!! It is nice to hear that VPN providers are prepared to offer at some point in time, in the distant future, long after everyone has forgotten the promise, a native Linux client. You are promising it, NordVPN are promising it, but few are offering the spit and polish that your windows client does. Why then are Linux users getting crumbs? We pay the same as Windows users and Mac users, but our options for a service from you requires us to jump through hoops as with most other providers. I recognize the effort that may have gone into the command line tool, I doubt many linux users would like this. I believe it is massively underestimated how many Linux users there actually are out there. People are fed up with Windows and Linux just works for us, so long as we don’t have to spend messing around at the command line. If any VPN provider wants to take the course of avoiding Linux users because of an assumption that their numbers are insignificant, I think that would be a mistake. May we ask, are you using any sort of hosts blocker on your machine? It has also started timing out asking for my password most of the time. I tried reenabling IPV6 but that just gave a different error message. I’ve installed this on openSUSE 42.3 and it works very nicely. No more DNS leaks, stable connection, etc. I’ve just noticed one problem. Once you disconnect the VPN, IPv6 connectivity isn’t restored automatically. I’ve tried this with both Networkmanager and wickedd for network manager. Could you look into this please? And I just noticed that if you wait longer (10 mins), it does come back. Please disregard. This also happened to me today. I’m using openSUSE Tumbleweed. protonvpn-cli connected fine. But when I did -disconnect it said error enabling IPv6. I thought it was nothing, but truth is I completely lost Internet connection. I tried Wicked Network settings and reboot but it did not help. After a while the connection did NOT come back. Please look into this. After seeing the original post I believe every openSUSE user might have encountered this. Really frustrating. Thank you very much. The above comment was for openSUSE Leap 42.3. On another machine, I am running openSUSE Tumbleweed. On this machine, I can install and run the client just fine. However, once it connects, I lose DNS resolution completely. I see that /etc/resolv.conf is updated with a new DNS server for the VPN but it appears to be unable to resolve anything. Can you look into this please? Thanks Peter. Mine always leaks DNS, and I have been unable to find a solution. Will try this. Tried this on my Linux mint setup and it worked flawlessly. I do have a question though, will we ever get a native linux client? One question though, how can we set it the VPN to connect when the computer boots? dns leak is still present. Kubuntu 17.10. connect via cli and the ip is changing. but the dns is not. http://www.dnsleaktest.com and http://www.ipleak.net reports the ISP own dns servers like the same and not protonvpn dns servers. (for reference, using openvpn on the terminal also never prevented the dns leaks). Is there a way to prevent the dns leaks? We have just tested it and it does not leak DNS addresses. If you leaked even with openvpn via terminal without our tool, then you could be missing some updates or resolv conf. You could install all of the latest updates and provide our support information about your /etc/resolv.conf and whats in it when you are connected to the VPN. Just installed Kubuntu 16.04/18.04 LTS. No DNS leaks for me. Thanks guys! I know linux users don’t make up the majority of your user base at this time- but I was really beginning to think we were forgotten! This was a fantastic way to start my day! We are always aware of our customers issues and suggestions. Also, its trully amazing to hear that we lightend up your day! I wrote a comment saying there are dns leaks on gentoo both with protonvpn-cli and openvpn. This is a correction to that comment: do not forget to install openresolv (as I did); once installed you will not have leaks any more. Thank you for letting us know, we will make sure to include that in our guide as a note. connecting via openvpn directly works without any problems. Thank you for your feedback, we will register this and test it out. Currently we update the client with Solus distributions and we will do so with openSUSE. I’ve installed it and got it working fine. But once connected there isn’t really a way to tell you are on a VPN (besides checking on a website). I wouldn’t know if i got disconnected. Where as the old method of using OpenVPN, at least you’d have the lock symbol on the network icon. Can anything be done about that? Thank you for your feedback. We just tried our client tool on freshly isntalled OpenSuse tumbleweed with all latest updates, and the client tool initiated like it should on any distribution. Could you please try to reinstall it and try agian ? Could you provide a guide for Manjaro/Arch linux? working great on Debian 9! I can see p2p, TOR and secure-core servers showing under features. Would it be possible to show the “Plus-servers” in the features field as well? Thanks for this, Proton*. I’ve just tried this on Ubuntu 17.10 (artful), and it seems to work, and with no DNS leakage too. I wonder, though, is storing the password as plaintext in the file at ~/.protonvpn-cli/protonvpn_openvpn_credentials really best practice? Might a future version of the scripts use a more secure scheme? Awesome! Finally my IP and DNS match perfectly. One point I need to make is in regards to instruction #4 where I had to insert a sudo in front of the chmod in order to complete. Now I am very happy to have subscribed for 2 years. Please make sure that you are entering your correct OpenVPN credentials and selecting the correct plan that you subscribed with ProtonVPN. Re-initiate the client by using protonvpn-cli -init. If still no luck, please contact our customer support team. Was totally my fault entered my OpenVPN password wrong. Everything is great thank you awesome job. Really interested in the software but i have problems with my distribution. I am using Solus and once installed (everything goes well during the install) I have an error “sudo: protonvpn-cli: command not found” even after a reboot. What can I do to make it work (if it is possible)? I made a ticket on the git repo about this error. This should be enough? Yes, this should be enough for us to investigate. I have exactly same problem on my Solus machine. Should the terminal stay opened after connecting or can it be closed? Awesome job, guys. Works like a charm! That means OpenVPN connection is already connected and running on your device. Ether you are using a different way to connect or you are already connected to the VPN server via this tool . Please disconnect that VPN and connect using our tool. 1) how to disconnect from ProtonVPN? 2) why should I use ProtonVPN instead of TOR? This will disconnect you from the server. 2 – Its totally up to your preference, if you want to use static IP`s that our VPN provide plus +AES256 encryption, or bounce your connection trough TOR random nodes each time you use it. Why not use both eh? You can do so with our TOR servers. When connecting to them you will firstly connect to the VPN server and then will exit trough TOR node which provides real high security levels.